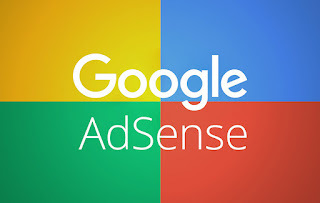 In the blogging world, especially in the world of those bloggers who have Google Adsense running on their blogs, there is nothing sweeter than having your Google AdSense earnings being paid into your account once you've reached your specified or required threshold. Inarguably, this is the joy of every blogger. It spurs you to do more as it overwhelms you with the feeling that you are making progress in the blogging world. Unfortunately, certain prerequisites to getting one's Google AdSense earnings paid into one's savings account (in any of the banks in Nigeria) have deprived so many Nigerian bloggers of such a joyous moment. 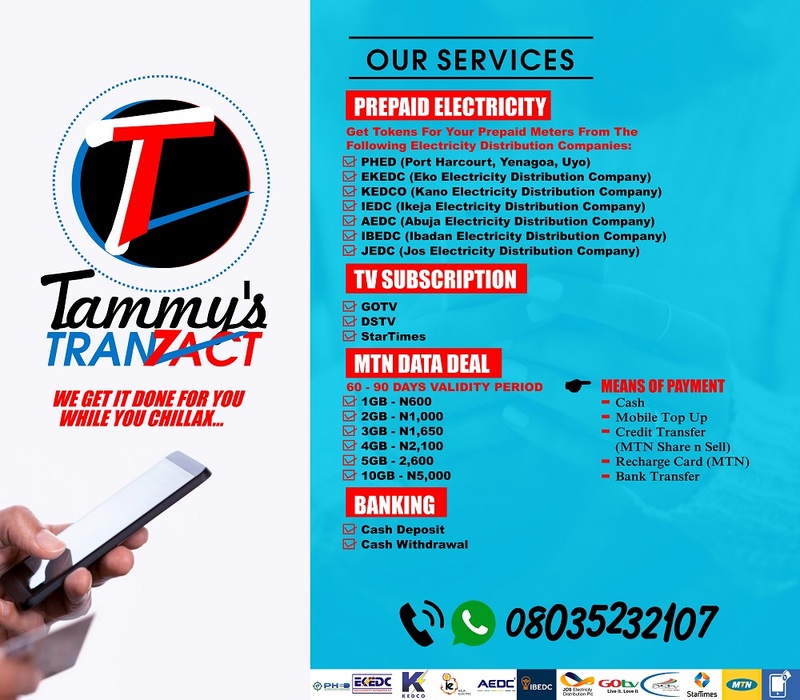 A well-known prerequisite is the opening of a domiciliary account (an account that lets you save and receive funds in currencies other than Naira) due to the fact that Google issues payment in U.S Dollar or GBP. In Nigeria, opening a domiciliary account with any bank, among other things, requires a minimum deposit of $100, which is about N35,000 or N36,000. The problem is not the opening of the account. Of course, anyone who is N35,000 or N36,000 rich(er) can open a domiciliary account. The problem is that transactions need to take place on that account from time to time; otherwise, the account closes. You don't just open a domiciliary account and fold your hands in wait until Google issues payment. Therefore, except you are sure of receiving payment from abroad (other than Google's AdSense payment) or reaching your threshold at the end of every month, do not open a domiciliary account irrespective of its advantages as regards receiving Google's AdSense payment. 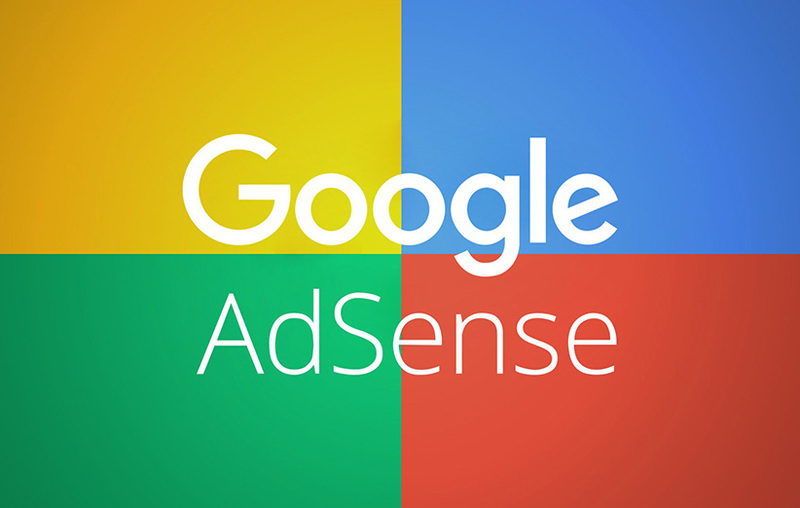 You can use your savings account to receive payment of your AdSense earnings once the payment is issued by Google. Yes, you can. Let's cruise! I have read so many articles online, explaining how to receive payment of AdSense earnings using either Diamond Bank, First Bank, United Bank for Africa (UBA) or Guarantee Trust Bank (GTB) with no information on First City Monument Bank (FCMB) as regards the topic. That was really saddening because I bank with FCMB. However, with the information I got from my bank, I gave it a try and it was successful. 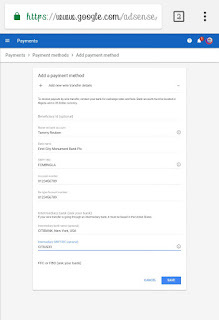 In order to ensure that other bloggers who bank with FCMB receive payment of their AdSense earnings without going through the stress of opening a domiciliary account, this article explains how to receive Google's AdSense payment using FCMB savings account. 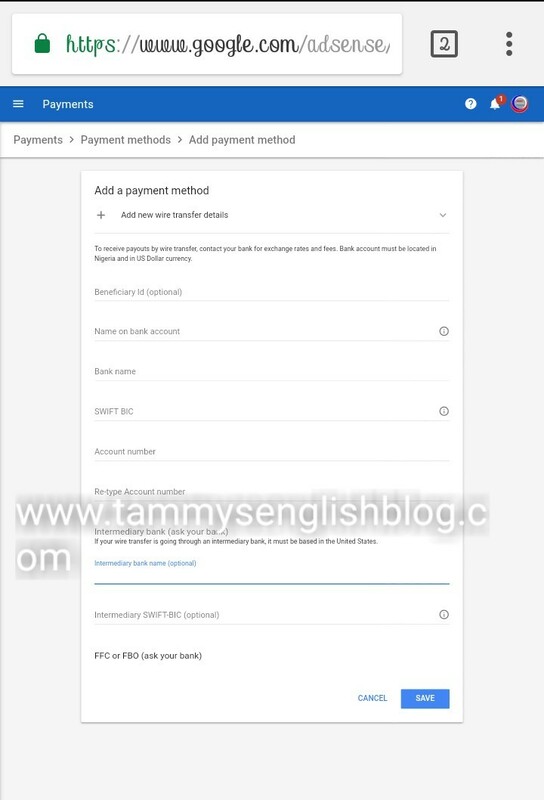 HOW TO RECEIVE GOOGLE'S ADSENSE PAYMENT USING YOUR FCMB SAVINGS ACCOUNT. 1. Login to your blog's dashboard. 2. On your blog's dashboard, click on earnings. 3. Click on Visit Adsense for details of my earnings. 4. Sign up with your blog's URL and email address. 5. On the next page, click on the horizontal lines close to the word "Home". 7. Click on Add payment method. 8. Choose Add new wire transfer details between the options given and a form like the one below will appear. This is how to fill in the form. Name on Bank Account: Put your account name (e.g. Tammy Reuben). Account Number: Put your account number (e.g. 0123456789). Re-type Account Number: Put your account number again. 10. That's all! You are good to go. 1. Google issues payment to publishers whose earnings have reached their specified thresholds on the 21st of every month. 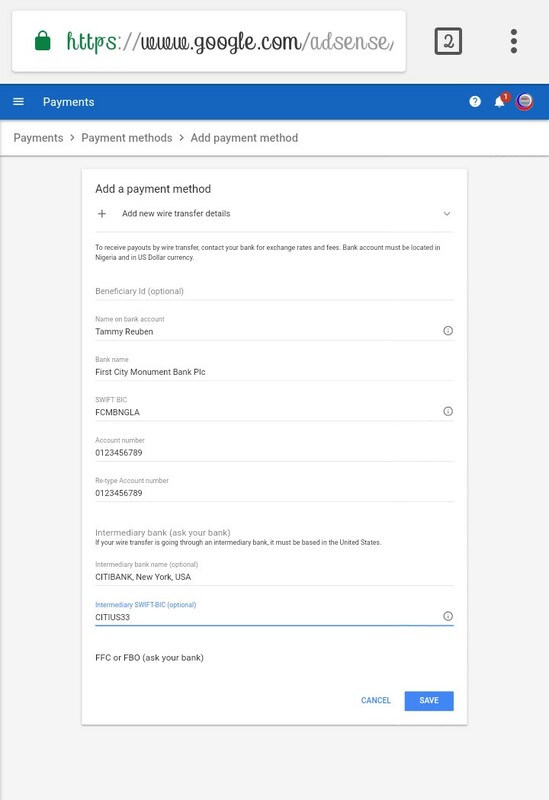 Once the issued payment is successful, Google sends your payment ID that will redirect you to your payment receipt when clicked. 2. Depending on your branch/bank, payment may or may not hit your account on the day it is issued. You may receive payment 1 -10 days after payment is issued. This is because your branch/bank needs to convert the amount (which is issued in US dollar) to naira before depositing it into your account. Therefore, you don't need to panic should you experience delay in receiving payment after Google has issued payment. Provided you filled in the correct information, you will receive payment. I received my payment five (5) days after Google issued it. 3. I advise you contact FCMB Customer Care Service on 07003290000 and provide them with the needed information once you notice that payment has been issued. This will also help expedite the process. I did same and the cash hit my account within five (5) working days. 4. 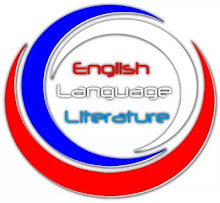 Should you have any question on the subject matter, kindly use the comment box and I will answer you ASAP. The 3 "X" means the branch code, which is not really necessary. Just use the swift code without the 3 "X," and you are good to go. That is what I use.